Contact mucositis is also known as Chronic Ulcerative Paradental Syndrome (CUPS). It is characterized by "kissing lesions" - red, inflamed, ulcerative lesions at the inner cheek lining and sometimes tongue edges. It is comparable to a "contact allergy" one might see elsewhere in the body (e.g. a person who reacts to skin contact with grass). In mucositis, there is an overreaction of the immune system to dental plaque. Cheek tissues directly in contact with teeth may react to the surface plaque bacteria. 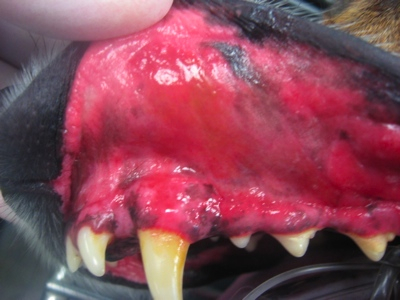 Contact mucositis can often be found in pets that suffer from other immune-mediated diseases (like skin allergies). Diagnostic work up includes detailed examination, dental radiographs (x-rays), and biopsy with histopathology. Plaque control is the key to therapy. In some cases, meticulous periodontal therapy combined with diligent oral home care will control the condition. Esterified Fatty Acids, either topical (EFAC®) or oral, can also help decrease the inflammation. In more extreme cases, extractions of the teeth in the most affected areas are performed with efforts to provide plaque control for long-term management. Some patients benefit from immunomodulation therapy as well to prevent future overreaction of the immune system.